Heavily armed police swarm to industrial valve company in southwest Chicago suburb of Aurora. 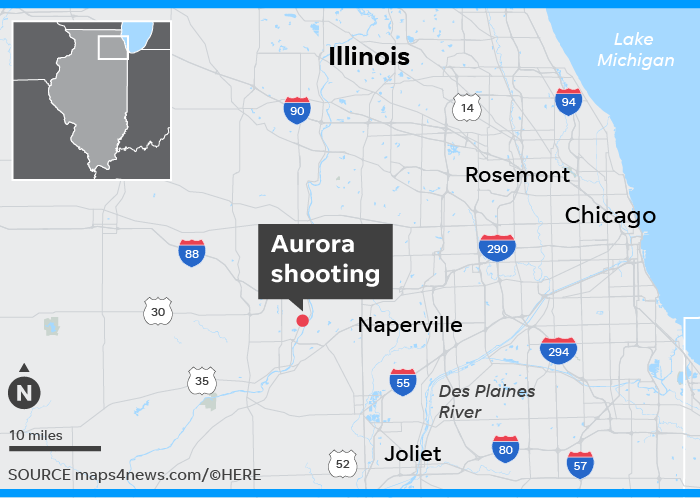 AURORA, Ill. — Five people were killed and six police officers injured after a fired factory worker sprayed bullets into the massive warehouse where he worked in this southwest Chicago suburb, police said. Officers found themselves immediately in an afternoon gun battle after arriving at the Henry Pratt Company plant in Aurora, Illinois, only four minutes after terrified workers called police for help, said Police Chief Kristen Ziman. The gunman, identified as 45-year-old Gary Montez Martin, was shot and killed by police, but not before he shot five of the responding officers. All of the injured police are expected to survive. Authorities said Martin had been told that he was being let go from work just before the shooting began. "I hate that we have to use the term classic workplace shooting, that pains me to do so, at this time I don’t know. Again, we can only surmise that with a gentleman who’s being terminated that this was something he intended to do," Ziman said. Five of the police officers suffered gunshot wounds, including two whose injuries were serious enough that they were transported to Chicago hospitals that specialize in trauma care. A sixth officer suffered a knee injury. All are expected to survive, Ziman said. One Henry Pratt employee also suffered non-life threatening gunshot wounds, police said. Police believe the five employees, all men, were killed before officers arrived at the scene. Officers who rushed to the scene faced a barrage of gunfire. Two of the first four to arrive on the scene were wounded, including one officer shot by Martin before he could even enter the building. Aurora Police officers, along with police from the neighboring community of Naperville, ultimately confronted Martin inside the building, about 90 minutes after the shooting spree started. The gunman fired on them, and the officers returned fire, killing him. It is unclear why Martin, a 15-year veteran of Henry Pratt, was being fired. Ziman said she was unaware of any other employees being let go Friday. At least one relative of the shooter was at police headquarters Friday night to be interviewed by detectives. A few miles from the 29,000-square-foot manufacturing warehouse, deputies from the Kane County Sheriff’s Office descended on the gunman’s home in a sprawling apartment complex. Much of the complex was cordoned off as officers went about searching the gunman’s home. Illinois Gov. J.B. Pritzker commended the “amazing” work of law enforcement officers who responded to the scene, saying that they “rushed toward danger, and in doing that … saved countless lives. May God bless the brave law enforcement officers who continue to run toward danger,” President Donald Trump tweeted words of support as well. Great job by law enforcement in Aurora, Illinois. Heartfelt condolences to all of the victims and their families. America is with you! John Probst, a worker at the company, told ABC7 that the shooter, armed with a pistol, was a co-worker. He said there were about 30 workers in the open storage room when the gunman opened fire shortly after 1 p.m. CT.
"He was shooting everybody . . . As soon as i heard the shot, we left. As soon as I heard it, I took off," Probst said. He said one of the victims "came running down and was bleeding pretty bad." At Acorn Woods Condominiums where Martin lived, a mix of brick apartments and condos nestled on a quiet street just a mile and a half from the shooting, neighbors gathered on sidewalks near Martin’s unit talking and wondering among themselves if they knew or had come in contact with him. Mary McKnight stepped out of her car with a cherry cheesecake purchased for her son’s birthday, to find a flurry of police cars, officers and media trucks. “This is a strange thing to come home to, right,” she said. She had just learned that the shooter lived close by and his unit in the complex had been taped off by police. Christy Fonseca often worries about some of the gang-related crimes and shootings around her mother’s Aurora neighborhood. But she never expected the type of phone call she got from her mom on Friday, warning her to be careful with an active shooter loose in the town. Police cars with screaming sirens revved past her as she drove to her mother’s house, where the Henry Pratt building is visible from the porch stoop. It was only when they flipped on the television news that they realized Martin had killed people just a few hundred feet away. “In Aurora, period, we’d never thought anything like this would happen,” Fonseca, a lifelong resident of the Chicago suburb, said as she looked out at the factory. The Henry Pratt Company, about 40 miles west of Chicago, is one of North America’s largest manufacturers of valves for the potable water, wastewater, power generation and industrial markets. It’s a subsidiary of Mueller Water Products, Inc., a NYSE publicly traded company headquartered in Atlanta, Georgia. The company was founded in 1901. During World War I, the Henry Pratt Company manufactured propellers for Liberty Ships and in the 1920s, the company made products for electric power plants and gas plants. The company has a tradition of industry firsts. When welding came into use in the mid 1920s, Pratt was instrumental in the design and production of the first welded smoke stack, which was installed at Commonwealth Edison’s Fisk Street Generating Station.